The Samsung Galaxy S6 is protected by various plastic foils to avoid transport damage on delivery. One of these skins is stuck on the camera lens of the Samsung Galaxy S6. This protective film for the camera lens leads to a reduced image quality after a while, especially if dust sticks to it. It is advised to remove the protective film as soon as possible, because you have more disadvantages with it than advantages in everyday life. The protective film is very good fixed on the lens of the Samsung Galaxy S6 camera, so it is not easy to remove it. Since the lens of the camera from Samsung Galaxy S6 is a sensitive component, one should be very careful when peeling off the protective film, especially when you'd use sharp objects to it. So that you can remove the foil which is glued onto the lens without problems and without damage, we have prepared here a little guide on this subject. Use it at your own risk! Sets the Samsung Galaxy S6 with the display on a soft but still stable surface, such as a newspaper, so that the display cannot be scratched. Now take the toothpaste tube and rotate it around so that the pressed flat end can be used to remove the foil. This is also the reason why you should use a toothpaste tube. The plastic tube is at the end very flat, but can not cause any damage, as it is the case for example with a needle. As you can see in the picture above, you now have to be careful with the edge of the foil to lift. This usually works after a few tries very good and you can lift and remove the film from the camera lens of the Samsung Galaxy S6. We hope that you were able to remove the film from the camera lens of Samsung Galaxy S6 with this manual without problems. 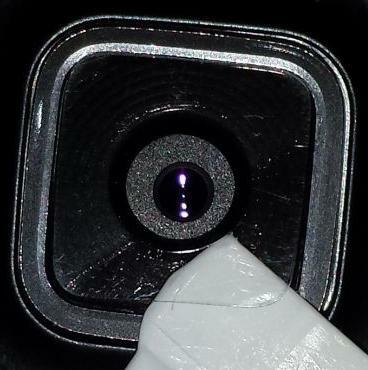 How i removed the film off the camera on my samsung s6 is by placing a piece of sticky tape on top and just peeling it off. Dont raise up. Peal off like you a label. Good grief. Just put a piece of Scotch tape over the film and lift it off.